The Green Line is one of the two lines on the Dubai Metro (the other is the Red Line). It opened in September 2011. The line runs from Etisalat Metro Station in Al Qusais to Creek Metro Station, passing through the densely populated areas of Deira and Bur Dubai. All 20 stations are now open. There are two transfer stations where passengers can transfer to the Red Line; Union and BurJuman (formerly Khalid Bin Al Waleed). 5 miles of the line (from Abu Baker Al Siddique to Oud Metha) is underground. Drivers can park their cars at the park and ride facility at Etisalat Metro Station. There are spaces for around 2,300 cars and parking is free for Metro passengers. Trains run every 4 minutes during peak hours and every 7 minutes at other times. Timings for the Green Line are Thursday 5.30 am to 1 am, Friday 10 am to 1 am, and Saturday through Wednesday 5 am until midnight. The Friday timetable for Green Line trains was changed at the beginning of October 2015. Prior to this, trains started running at 1 pm on Friday. The start time for other days was brought forward in November 2017. The map below is a schematic representation of the Dubai Metro system. Stations on the Green Line are highlighted. The table below shows all stations on the Green Line plus nearby hotels, shopping malls, and tourist attractions. Abu Hail 17 Deira 5 . 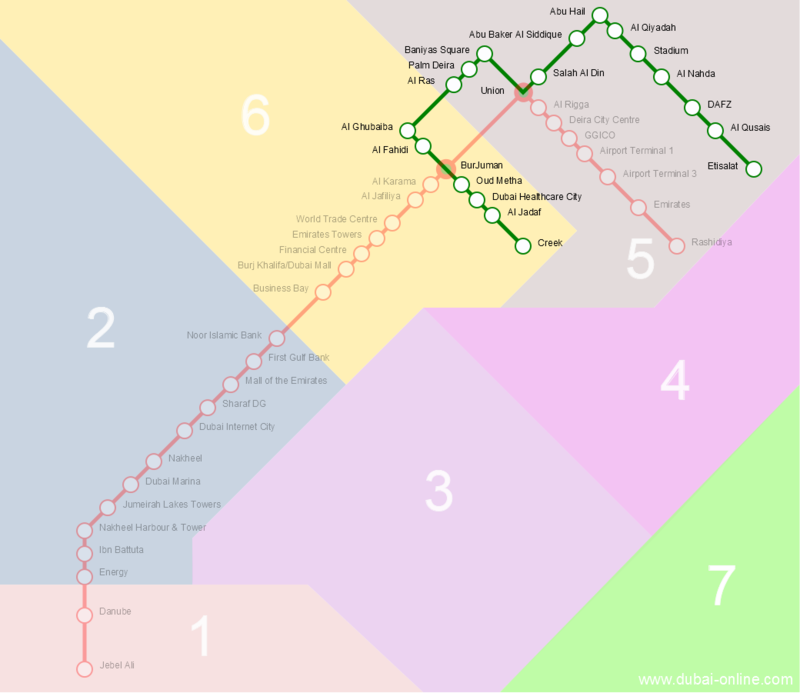 The map below shows the route of the Dubai Metro Green Line, overlaid on the map of the city. Click here to see an interactive map with Google Street View and other features. 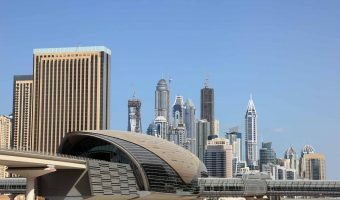 How to get to Sheikh Zayed Road from Dubai International Airport? I’m going to Roda Beach Resort from airport. Can the metro take me to an area close by? Or would it be better to just take a taxi to there straight away? How to get to Gold Souk from Dubai Mall via Metro? Take the Red Line from Dubai Metro to BurJuman. Change to the Green Line and get off at Al Ras. We’re going to be staying in an apartment at the Dubai Marina. Will we need to use the Green Line to travel to the Gold Souk? Yes, if you want to travel by Metro. You will need to get on the Red Line at Dubai Marina Metro Station (though Jumeirah Lakes Towers could be closer depending on exactly where you are staying). Get the train going towards Rashidiya but you will need to change to the Green Line at BurJuman Metro Station. For the Gold Souk you can get off at Al Ras Metro Station or Palm Deira Metro Station. Al Jadaf and Creek stations opened in February 2014. All stations on the Green Line are now operational. Is there any plan to link Dubai International City by Metro? If so when would be able to travel to and from from our residence. Please reply soon. Thanks. The Green Line is supposed to be extended to International City by 2020 according to the information I’ve seen. 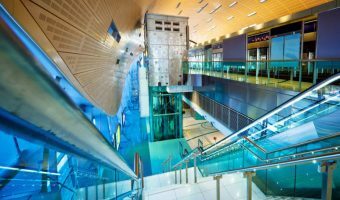 Check out our guide to the Dubai Metro. Includes fares, timetable, plus interactive maps of both lines. 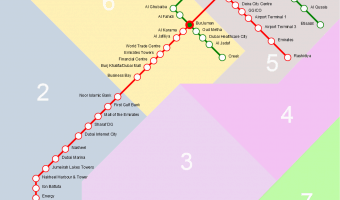 Interactive and schematic maps of the Dubai Metro system. Shows all Metro stations, transport zones, and more. Find out how much it costs to take a trip on the Dubai Metro. 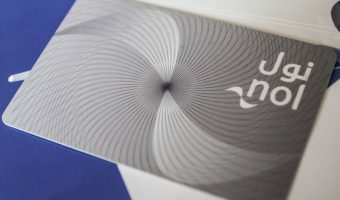 Learn about Nol Cards, tickets, and transport passes.